While secretary of state, Hillary Clinton attempted to bully the tiny nation of Bangladesh to force it to end a corruption investigation of Muhammad Yunus, a long-time Clinton family friend and Clinton Foundation donor, according to documents obtained by The Daily Caller News Foundation Investigative Group. The information comes from two Bangladeshi government documents generated as part of a request from the U.S. Congress. The documents shed new light on Clinton’s use of hard-ball tactics against the poorest country in South Asia in order to help her millionaire friend and Clinton Foundation donor. The documents show the Democrats’ 2016 nominee for president deployed an array of high-powered officials at the Department of State, U.S. Embassy, and World Bank to rescue Yunus, who faced financial mismanagement charges at a state-owned banking institution called Grameen Bank. He eventually was removed from the bank. Yunus’ net worth is estimated at $10 million. His own U.S.-based nonprofits donated up to $300,000 to the Clinton Foundation, according to the foundation’s website. In 2010, as a Grameen Bank managing director, Yunus faced multiple charges of financial improprieties, including accusations in a Danish documentary that he diverted $100 million from Grameen and transferred them toward his own entities. The charges sparked an immediate uproar in impoverished Bangladesh, where the per capita annual income is about $1,000. The U.S. has been the largest donor to the World Bank and in 2011 contributed $1.5 billion to it. Clinton, as secretary of state, wielded tremendous influence over it. Clinton’s action on the bridge appeared to be designed to undermine and humiliate Hasina, one of the only female heads of state in the Muslim world. The Wall Street Journal described the Padma River project as “a centerpiece” of Hasina’s pledge to improve infrastructure in her country. Hasina hoped to build a road-rail bridge over the river to link undeveloped regions of the country to Dhaka, the capital city, which would generate new business investment and create thousands of jobs. 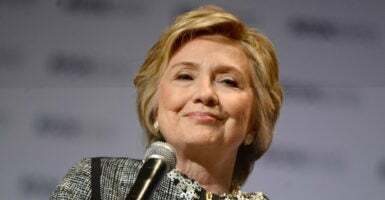 The report of Clinton’s brass knuckle tactics and her use of the World Bank on behalf of a Clinton Foundation donor could widen an ongoing investigation by the Senate Judiciary Committee, which is examining pressure tactics she used against the small South Asian country. On June 1, Judiciary Chairman Chuck Grassley, R-Iowa, asked Secretary of State Rex Tillerson to respond to reports that Clinton tried to pressure Hasina by threatening her son with an IRS tax audit while he was living in the United States, as The Daily Caller News Foundation previously reported. “I’ll continue to press for answers from the State Department on whether anyone suggested an IRS audit or used other pressure out of special consideration for a Clinton Foundation donor,” the Iowa Republican said at the time. Clinton’s opening salvo came in early 2011, when U.S. Ambassador to Bangladesh James Moriarty visited Dr. Dipu Moni, then the country’s female foreign minister. Moriarty repeated a Clinton claim that Grameen Bank was an “independent” nongovernmental organization designed to help the poor, mainly women, through an experimental program called “microfinancing.” Micro-financing allowed borrowers to set up small businesses with loans as small as $25. But the foreign minister retorted that Grameen was a state-chartered and government-funded bank, not an NGO. Publicly available documents show it is a state-owned bank. Clinton apparently escalated her attacks. The documents report a March 2011 meeting in the prime minister’s office with top U.S. officials. Joining Moriarty for the meeting was Robert O. Blake, who was Clinton’s assistant secretary for South Asia and Central Asia. Also accompanying Blake and Moriarty was former World Bank President James Wolfensohn, who was appointed by former President Bill Clinton, the secretary of states husband. “During this conversation, Mr. Wolfensohn looked a bit embarrassed,” according to one document. Blake, the State Department official, also tried to enlist the country’s elites to lobby for Yunus in order to put additional pressure on the government, according to the documents. In one phone conversation, “he was very, very insistent and it was made very clear that there would be consequences if we did not oblige,” she said of Blake. Blake did not reply to a Daily Caller News Foundation inquiry on his interactions with Bangladesh leaders. He now directs the India and South Asia practice for McLarty Associates. The co-founder of the firm, Thomas McLarty, formerly served as Bill Clinton’s White House chief of staff. The Ontario Superior Court dismissed all the corruption charges this past February. The Clintons originally became friends with Yunus when Bill Clinton was governor of Arkansas. Both were enchanted with his vision of microfinance, and Bill Clinton is credited with lobbying on his behalf to secure Yunus the 2006 Nobel Peace Prize. Yunus also has been a regular fixture at the Clinton Global Initiative meetings. A search of the Clinton Foundation’s website shows it issued 41 press releases praising Yunus.